Lives are at stake in the redesign of Woodhaven Boulevard and Cross Bay Boulevard, making the implementation of bus rapid transit on this southeast Queens corridor all the more urgent, according to a new analysis from the BRT for NYC coalition. Crash stats bring home the point that new pedestrian islands and other safety measures in DOT’s Woodhaven BRT project are critical to reducing the carnage on one of the most dangerous streets in the city. 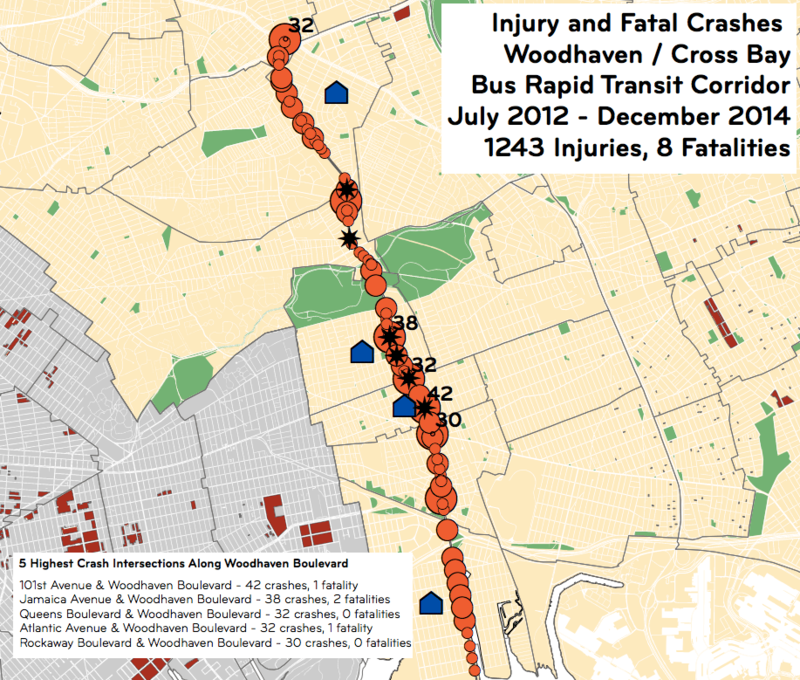 Woodhaven Boulevard regularly appears near the top of the Tri-State Transportation Campaign’s list of the city’s most dangerous streets. More pedestrians were killed by motorists on Woodhaven from 2011 to 2013 than on any other street in Queens, Tri-State reported in March, outpacing notorious roads like Queens Boulevard and Northern Boulevard. Citywide, only Flatbush Avenue and the Grand Concourse saw more pedestrian deaths. Among the victims was Yunior Antonio Perez Rodriguez, 35, killed by a hit-and-run driver after he stepped off a pedestrian island near Jamaica Avenue in December 2013 — just months after another man was killed trying to cross Woodhaven at the same location. On Woodhaven at Atlantic Avenue, 90-year-old Roger Pariente was killed in a five-car crash triggered when two southbound drivers side-swiped each other in December 2014. Pariente was a passenger in a car going the other direction when the two drivers crossed the median and struck cars in front of him, reports the Forum. Pariente’s vehicle rear-ended one of those cars and he suffered a fatal head injury. The death toll on Woodhaven has been high for years. Fatal crashes happened at 101st Avenue in 2007 and in 2005, when a 77-year-old man was killed as he tried to cross Woodhaven. Woodhaven’s high crash rate came up in the news again last month when a bus driver heading to the Resorts World casino crashed into a Rego Park building after making an illegal U-turn, colliding with another vehicle. Six people were injured in the crash. DOT is still developing the details of its plan for Woodhaven and Cross Bay boulevards, which is scheduled to begin construction in 2017. In principal I wouldn’t be against HOV vehicles in the bus lane. The key though is how would you enforce it? If there was some automated way to enforce it then it could work. If the police do it then enforcement will be spotty at best. The end result would be lots of non-HOV vehicles in the bus lane. Without looking at the other options I can’t say which would have been best. You may well turn out to be right. I personally think the MTA has a lot riding on having a successful outcome here. I suspect they may end up doing a lot of tweaking if the initial results aren’t as expected. When I said hurting more than you help, of course I wasn’t talking about physical harm. I didn’t say you were. I was pointing out the difference between the number of people who are hurt vs. helped and the amount of hurt vs. help. What I really should have said was causing more harm than good. That translates into more minutes lost than is gained. Right, that’s what you should have said. I was just pointing out that it wasn’t what you actually said. The reason people are supporting the Rockaway Beach branch is because it is only a plus. Ignoring the costs involved, you’re right: It is purely an expansion of the transit system that doesn’t directly interfere with any other modes. Considering the numbers of people who will likely use it and the cost to restore and operate it leads to a very different conclusion. The legitimate questions are what would it cost and would it be worth it. The really legitimate question is the latter one. And the answer is almost certainly “no,” as the MTA has previously concluded (admittedly that was a study of restoring LIRR service, but many of the factors cited as negatives still apply). Under your assumption that no one reads or pays attention to any signage, we should just eliminate all signage. Well good luck with that one. No one said he didn’t check for other vehicles. He just didn’t do a very good job of checking. The bus could have been approaching at a high rate of speed which he could have misjudged. I’m struggling to imagine that the bus could have been approaching at a speed too high for him to judge correctly…if, that is, we assume that he is/was a competent driver. He was still wrong in any case. But the poor signage was a contributing factor to the accident any way you look at it and that is the point. A person who is incapable of ensuring that the adjacent lane is clear before moving into it is not going to be helped by any amount of signage. That actually seems to be the rule over there. I noticed it when I watch the Tour de France. Once they leave the city proper, it’s not long until they’re out in farmland. This is unlike typical American cities which are surrounded by a 50 mile ring of suburbs of ever decreasing density before you might get near farmland. Often you don’t. Instead, you’ll start to hit the suburbs of the next city. I’m not sure about farmland, but legally the boundary of Munich is roughly the red line here. Meanwhile the urban core is dense enough to support a heavy rail metro. It’s not just Munich either. Many German cities are strange that way. There is a big difference between “bus lanes may be used for right turns” and motorists are required to use the right lane for right turns. A sign that states “buses only” implies that right turns are not allowed. Okay’ then exactly what is the f’ing law? The SUV was in the proper lane according to the signage, but gets a ticket for being in the improper lane anyway. The summons should have been issued for failure to exercise due caution, not for being in the improper lane. Even if there is language in the law stating bus lanes may be used for right turns, that does not mean, they are required to. Also, it is ridiculous that you are only allowed to be in the bus lane if you are making a right turn on the following block. If that is true, that makes the unreasonable assumption tat everyone knows the street direction of all upcoming blocks. Many times you can have two or even three streets in a row that go in the same direction. One cannot assume that streets alternate east and west or north and south. The law should allow you to use the bus lane as long as you are making the next available right turn that is not a driveway, if that isn’t the law already. If it is, all DOT sigs that say ” buses only” and do not include the words “right turns” would be in error. It is also DOT’s responsibility, not the motorists, that these signs are visible while traveling at a reasonable rate of speed. If you have to slow own to read the signage, that would be another hazard they are creating. If you don’t know that motorists are required to turn right from the rightmost lane, I can only hope that you are not licensed to drive. There was no jump to an invalid conclusion. Yes not all drivers pay attention to every sign. But that is human nature. It is not unique to drivers as you seem to imply to insinuate they shouldn’t be allowed on the road. I could make the same argument about bus riders. Many never bother to look at destination signs and get on a bus that is not going as far as they would like. Does that mean tey shouldn’t be allowed to ride the bus? If the bus was a great distance behind, it is not easy to judge speed if the bus was traveling faster than the driver expected him to be traveling at and could have assumed there was enough time to complete his turn. I am not saying that is what happened. Just that it is a possibility. You on the other hand jump to the conclusion that he never checked his mirrors. Residents have reported that buses have been speeding since the creation of the bus lane. The point still is if the signage was clear, the SUV woud have made the turn from the bus lane, and there would not have been any accident. That study made certain assumptions which may not still be valid today. Times change. Another study now before this major mistake starts construction would certainly be appropriate especially when the state has made that money available. As far as the numbers of people that may use it, we shoud not be talking about the first day it is placed in operation, but five and ten years down the road also. No one expected the #7 extension to be well utilized when that opened either and I doubt that it was. As far as numbers being helped and hurt, I never was talking about pure numbers of people but the product of the number of individuals multiplied by the number of minutes saved and added. So if there is an unoccupied parking lane, you are saying that one must make the right turn from that lane even if the lane to the left has a right arrow in it. That would cause an accident if there was only one receiving lane. So when a driver sees a sign that says “Buses Only” he is supposed to know it only applies for the block he is on and not on the next block. That is absolutely ridiculous. That sign applies until there is another sign which says something to the contrary. According to your logic if someone sees a speed limit sign, he should be able to argue that it is only in effect on that block where it is posted which of course would not be the case. There is only so much tweaking can do when the proposal is rotten to the core. And the MTA isn’t as much the problem as DOT. They are the lead. The MTA is just along for the ride. There are minimal changes they can make one operation has begun. They will just have to live with what DOT creates. As far as enforcing HOV lanes, how do they do it on highways? I haven’t heard about any automated enforcement. As far as I know, someone gets a summons when they are spotted in the SUV lane inappropriately. I also understand there is a problem just enforcing the regular bus lanes. So why are we so concerned about HOV lanes being 100% enforceable. The threat of a summons should be deterrent enough. If it isn’t perhaps we need to rethink the entire concept of bus lanes, not only if it includes HOV. We shoudn’t expect bus lanes with HOV to be adhered to more than bus lanes without HOV. Yeah, the point is the metric to look for is blocks or tracts of high urban density, not high average municipal density (e.g., Paris or Manhattan). Munich probably has some similar density in its core. Though it seems some German cities surprisingly do not (Hamburg?) and they still manage robust high-capacity transit. Unfortunately not many sources standardize this. Queens is relatively easy to figure that out in, even in crude ways with zip codes. The Woodhaven corridor is pretty dense; dense enough for heavy rail, in fact. The key though is how would you enforce it? He wouldn’t, at least not in any meaningful way. Which is exactly the point. A sign that states “buses only” implies that right turns are not allowed. Anybody who believed that yet made a right turn from the second lane (without yielding to traffic in the right lane!) would then be in violation of both the actual law and his or her mistaken impression of the law. And that would be 95 percent of the drivers on the road. If they put up a sign that says buses only because they do not want you to be in the bus lane for that block, they need another sign on the following block that includes the words “right turns” in print that is large enough to read from a vehicle while driving at the lawful speed. That is not the case. They have created an unsafe situation. 95% of drivers on the road would mistakenly believe that right turns are illegal wherever there is a bus lane, yet they’d go ahead and turn across the bus lane anyway, without even bothering to yield to traffic in that lane? Boy, you must think that drivers are beyond incredibly stupid. Do the signs also need to inform drivers that they should use their turn signals and should yield to pedestrians in the crosswalk and should remember to turn on the headlights at night? Perhaps we should go ahead and list every single driving law on every single sign. Our perhaps instead we should expect motorists to be aware of the law. As far as the numbers of people that may use it, we shoud not be talking about the first day it is placed in operation, but five and ten years down the road also. What will change in that corridor during the next 5-10 years? AFAIK, nothing. No one expected the #7 extension to be well utilized when that opened either and I doubt that it was. It wasn’t and isn’t, but there are very large amounts of construction happening in the Hudson Yards area right now that will greatly increase the traffic base for the new station. To the best of my knowledge, there’s no comparable situation anywhere along the RBB corridor. There was no jump to an invalid conclusion. Yes not all drivers pay attention to every sign. But that is human nature. And yet you assumed that I was implying (or even that what I said implied) that we might as well get rid of road signs. I wasn’t implying that at all and it wasn’t a reasonable conclusion from what I said. That was the jump to an invalid conclusion. If the bus was a great distance behind, it is not easy to judge speed if the bus was traveling faster than the driver expected him to be traveling at and could have assumed there was enough time to complete his turn. If that’s what happened, that’s a driver who shouldn’t be on the road. If you are not sure that you can safely occupy the adjacent lane, you have no business moving into it. Period. You on the other hand jump to the conclusion that he never checked his mirrors. I never said that. I did question your assumption that he did check his mirrors. It is possible that clearer signage would have helped. It is also possible that it would not have. That’s all that can fairly be said. Again, you’re jumping to an unjustified conclusion. I am not aware of other roads with bus lanes with signs that say “Buses Only” without adding right turns when you need to make a right turn at the next street and one is possible. On Hylan Blvd, if the sign says ” Buses Only” it is because no right turn is possible on the next street where there is another sign that states right turns are allowed from the bus lane on the following block. I was not jumping to any conclusions at all. Your blanket statement that it is rare that a driver will read a sign, certainly implies we either better educate drivers to read them, or we don’t waste funds posting so many signs. As far as the driver being “sure” you obviously speak from inexperience being a driver. There are instances where one can never be sure, but just use his best judgement. Once I stopped at a stop sign and saw another vehicle 200 feet away, so I proceeded to cross the intersection because it appeared safe to do so. How was I to know that driver was doing 50 mph in a 30 mph zone? The result was a near collision. From that distance I could only assume he was traveling at a reasonable speed but I couldn’t be SURE. If I would take the approach never to cross an intersection when any car is in sight, I could be waiting 15 minutes at every stop sign which you would seem perfectly reasonable to you. Whatever one does in life, he makes his decisions by the information that is available to him at the time and unfortunately, sometimes it is the wrong decision. Any new rail results in higher property values and new construction and probably some zoning changes to accomodate denser development. Low end land uses like auto repair shops are replaced when property values rise. Those changes result in greater transit usage. Many never bother to look at destination signs and get on a bus that is not going as far as they would like. Does that mean tey shouldn’t be allowed to ride the bus? Passengers who board the wrong bus don’t jeopardize other people’s safety. If the bus was a great distance behind, it is not easy to judge speed if the bus was traveling faster than the driver expected him to be t raveling at and could have assumed there was enough time to complete his turn. When you make a turn, it is your responsibility first and foremost to ensure that your turn does not conflict with anybody else’s movement. That means pedestrians in the conflicting crosswalk, that means cyclists in the bike lane or near the curb, and that means conflicting motor vehicle traffic (for normal drivers this only applies to left turns, but if for some wacky reason you’re makinga right turn across an active motor vehicle lane, the law applies then as well). Not sure if there’s a conflict? Then slow down and take a closer look until you are sure that there is no conflict. Residents have reported that buses have been speeding since the creation of the bus lane. This is rich, coming from someone who insists that motorists have the right to drive at whatever speed they feel is safe. Incidentally, the way to determine whether buses are speeding is to take speed measurements of buses, not to take the whines of bus lane opponents as gospel. I suspect that what the complainants really mean is that buses can now pass them when they’re stuck in traffic jams. Well, yeah, that’s exactly the point. Get over it. So you claim, without a shred of evidence. They are now stuck in traffic because of the bus lanes reporting trip time increases of 45 minutes with some traveling miles extra to switch to the congested Van Wyck because it is now quicker. If there were no bus lane or proper signage the SUV would have made the turn from the right lane. Hence no accident. That is my evidence. Your assumption that he would have ignored the signage is unsubstantiated. I was not jumping to any conclusions at all. …because I never made any such assumption. I didn’t say that. Please go back and read what I actually wrote, and, if necessary, study the use of the comparative in English. certainly implies we either better educate drivers to read them, or we don’t waste funds posting so many signs. The state of driver education in this country is indeed abysmal, but that was not my point here. And signs are obviously necessary. You made an assumption about how fast an approaching vehicle was traveling without actually looking to see how fast it was going? What the hell kind of driver are you, anyway? But if one is prudent, one takes the time (in this case, possibly an additional second or two) to gather the information one actually needs before proceeding with anything. It seems you think that’s unnecessary. And yes if the signage was not confusing, there would have been no accident because te turn woud have been made from the bus lane. That is not jumping to any conclusions. Of course it is: It’s jumping to the conclusion that the driver who caused the accident would have read the sign. If you were more reasonable in the way you worded things, you could have said, “If the signage was not confusing, the accident would have been less likely to happen because the driver might have seen it and made the turn from the bus lane,” and I would have no quarrel with you…on this, anyway. But you seem to be constitutionally incapable of making careful, reasoned arguments. Instead, you make blanket statements that aren’t supported by the facts or by reasonable inferences from them. You just can’t not jump to conclusions, can you? New rail service does not automatically result in any of the things you named. Specifically, zoning changes are usually required in order for the desired development to take place in conjunction with the rail service. The rail improvement does not result in zoning changes. There are many examples of new rail service that has not lived up to its potential due to the failure of the jurisdiction where a station is located to make the zoning changes necessary to permit development of the sites adjacent to the station. Whether the zoning would be changed along the RBB corridor if it were restored and operated for passenger rail service is a crapshoot, particularly given that the corridor is full of NIMBYs. I’m not saying they’re right; I’m just saying that they might well be able to block the changes needed to make rail work in the corridor now. I appreciate your implicit acknowledgment that the corridor in its current state is unsuitable for rail service. and this is undesirable in what way Allan Rosen ? a handful of single occupancy cars are inconvinenced while tens of thousands of bus improve their travel time. Really ? Is that why the MTA won’t answer any questions about the line or the SBS study ? It points more towards the unwillingness of a small group of home owners squatting on MTA property in Forrest Hills that are opposed to the land that they stole from being taken away. The MTA has NOT provided any answers to any of the question posed to them, NOT ONE. Your accusations are baseless and unfounded, Your quote of “Ridership numbers are not there” is totally “MADE UP B.S.” and is based on information from 1950. I wouldn’t be surprised if you were one of the greedy home owners opposed to the QueensRail project. I guess you better find a good real estate agent then because, there’s a railroad coming through ! Look’s like someone has to “Eat the Macaroni” ! No matter how much the car-haters hate to admit it, poor people and immigrants too aspire to buy cars, for freedom and convenience, as well as to get to work. They save and borrow to get one, and use them. The majority of city residents don’t drive into Manhattan. That’s what I was talking about. Those who own cars might use them to go out of town or for shopping, but not to commute to work in Manhattan. Note that there’s a difference between a car hater, which I’m not, versus someone who simply acknowledges the reality that a car is just the wrong tool to get around in dense urban areas. NYC couldn’t accommodate everyone getting around by car. As it is, relatively few people here drive regularly, and yet the streets are still a traffic-clogged mess. The mathematics work again cars in urban areas. Street space is limited, and cars just take up too much of this space per person moved. Oh, and really poor people can’t afford cars, whether they aspire to them or not. Hey, I aspire to go to Mars, live in Trump Tower, maybe even be captain of my own starship. These things are about as likely to happen as a really poor person owning a car. I never wanted a car, but I could never afford one even if I wanted one, and I’m an Ivy League graduate. Hard to see how someone working at minimum wage can afford one. Bingo. So if they’re already taking transit what’s the point in investing in SBS/BRT if it is not going to result in diverting more trips? A plan that Allan Rosen, who I’ve known for 25 years back when he was with the MTA, has pointed out will actually inconvenience many transit users..Especially when it is going to add to the time, costs, and hassle of those majority of car-owning residents who are driving to non-Manhattan CBD destinations, not to mention commercial vehicles. And oh yes never underestimate the desirable convenience factor of driving even if it is a PITB in the city,no matter what your income is. The car-lined streets of Richmond Hill, Ozone Park et. al are living proof–confirmed by data cited by the NYCEDC. Faster bus travel times always result in more people using the bus. Whatever the flaws in this particular plan, the more routes we convert to SBS/BRT (ideally that should be ALL city bus routes), the more people will use the bus. Just a single isolated line might not get much increase in ridership, for the same reason a single, isolated subway line won’t attract as many riders as it would if it were connected to a more comprehensive system. However, the city has to start somewhere. It happened to pick Woodhaven. When buses on Queens Boulevard, Union Turnpike, Main Street, and other routes also go SBS/BRT, then suddenly the bus will be useful to replace a lot of those car trips to non-Manhattan destinations. As for any supposed delay to private car users, that’s acceptable in the scheme of things for two reasons. The faster the bus is relative to driving the more people will use it. Faster buses and/or slower driving both accomplish this. Second, from a fairness standpoint of street use, a bus carrying 50 people should have priority over private cars with one occupant. Street space in NYC is limited. The city is entitled to reallocate it to move the most people. That doesn’t necessarily mean moving the most private cars. In the case of Woddhaven, if the concern was losing a travel lane because of a bus lane, perhaps the parking lane could have replaced the lost travel lane. Except of course drivers don’t want to give up parking, either, even though that’s about the worst use of limited street space. Since you mentioned delivery vehicles, I actually do favor making things better for them. That would include getting rid of curbside parking in favor of loading zones, and taking steps to get people to switch from cars to buses, bikes, or trains. There are obvious economic benefits to speeding up delivery vehicles, even if it’s at the expense of people in private cars. And oh yes never underestimate the desirable convenience factor of driving even if it is a PITB in the city,no matter what your income is. People might like the convenience of driving but most are unwilling or unable to pay the true cost. If people had to pay market rates to park, and enough other fees to account for all the negative externalities of driving (this would be upwards of 40 cents per mile), few people would consider the convenience worth the cost. It’s only because we as a society directly and indirectly subsidize driving that it’s considered desirable by many. Now there may be benefits to subsidizing transportation but only if you subsidize the modes which make sense for any given location. In NYC that would be public transit. In Nebraska it would be private automobiles. Please note that if you are under 18 do not to applpy,write all your information properly checked with your countries high commission, so make sure you really are applicable to you. BORROWERS INFORMATION 1) Full name:……… 2) Country:……… 3) Address:……… 4) State:……… 5) Gender:……… 6) Marital status:……… 7) Job ………. 8) Phone number:……… 9) Current position instead of work: 10) Monthly Income:……… 11) Loan Amount Requires:……… 12) Loan Duration:……… 12) Did you apply for a loan Before ………. 13) Age ……….